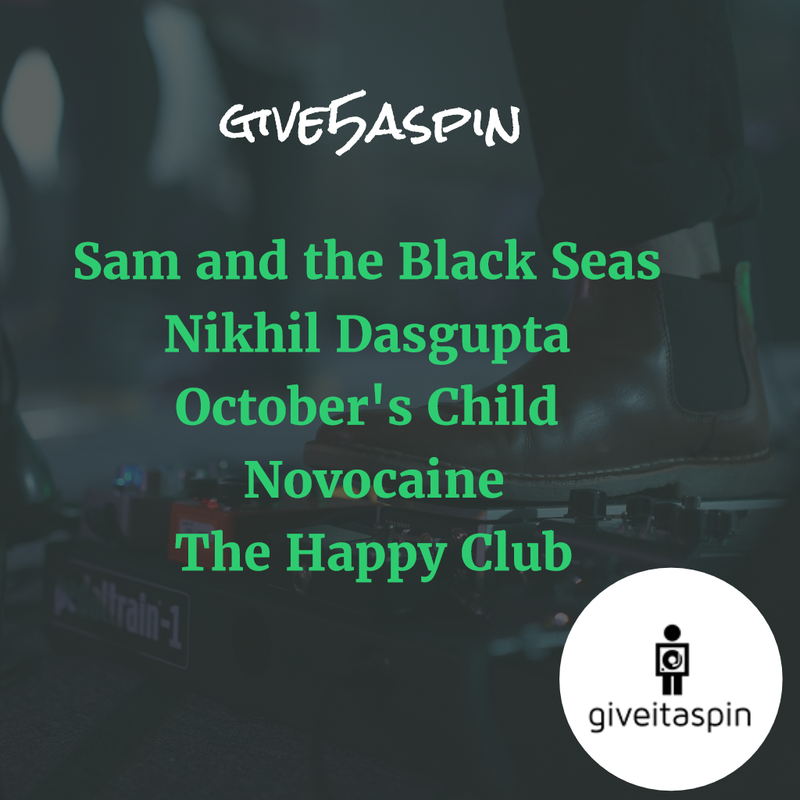 give5aspin: Sam and the Black Seas, Nikhil Dasgupta, October's Child, Novocaine, The Happy Club | Give it a spin! mixed by Matteo Sandri at the Mono Studio and mastered by Giovanni Versari (Drones – Muse) at La Maestà studio. The song is the first indication of what to expect from the forthcoming debut album “Silver”, which is set to arrive in June 2016. An exciting live band, Sam and the Black Seas line up of Samuele ( lead vocals /guitar), Mattia (Cello), Andrea (guitar), Stefano (drums) makes for an uplifting and refreshingly upbeat set of acoustic tunes. Sam’s bittersweet lyrics compliment the band’s infectious melodies perfectly and the result is folk tinged alternative pop at it’s very best. UK live dates will be announced very soon. Nikhil Dasgupta, age 21, has spent his life between five different countries, and in that way has built a life more committed to people than places. A multi-instrumentalist, though he often chooses to lead his studio band on piano, his songs speak about relationships and about journeys from one place to the next; about the space between two trapezes. With his latest release, “Don’t Look Down”, Nikhil has augmented his previously more folk oriented style with string and horn sections, producing a completely new energy with a much sharper personality. Each song tells a story, one that is compelling in its novelty, yet familiar. The EP deftly explores the range of the orchestral approach, ranging from the explosive brass of “Adeline” to the pensive and textural string supported ballad “Stubborn Heart”. You can download or buy the album on bandcamp. LA based duo-October’s Child, music sounds like a Grimm’s Fairytale come to life–darkly beautiful, otherworldly, and doomed. “Empty Hourglass” is minimal, featuring Waré’s harp-like guitar and creeping violin and Warner’s heartbreaking vocals, lamenting The End and a life not fully realized. In Warner’s words: “I wear a “Death Is Certain” patch on my jacket to wake up those who might need the reminder. It’s a waste of your miraculous existence to live every day the same, and if you don’t give yourself a reason to keep getting out of bed in the morning, the universe takes note.” October’s Child will release their first full-length album this upcoming fall before embarking on a European tour. Paradox is a song that starts like a gentle breeze, but ends up as an autumn storm! Novocaine is a 5-piece from Bergen, Norway, always striving to play the kind of music they’d love to go out and listen to themselves – you might call it atmospheric indie, or maybe shoegazy melancholic rock. Novocaine started in 1999, played hundreds of gigs, had a minor radio hit in Norway (“Dancing”), but called it quits in 2004. After a decade had passed they decided to pick up where they left, adding a keyboardist and changing drummers. Now, with a new bassist as well, they are currently working on a full album due to be released in 2016. The Happy Club is the moniker of Canadian singer-songwriter/multi-instrumentalist Trevor Cameron. Other members include Will Walther (keyboards, vocals) and Spencer Manning (drums, tabla). The project began in late 2015, and the self-produced debut EP “Where to begin…” was released on Bandcamp in May. If your looking for some psychedelic rock or sunshine pop to fill in your summer nights be sure to head on to bandcamp to purchase/support the album. Sonic escapism, musicality evoking sunny damped afternoons on the porch, shimmering optimistic and romantic auras all create a yonder-wall of harmonies. Got to say, “The Winds” and “Pages” have also captured my heart.